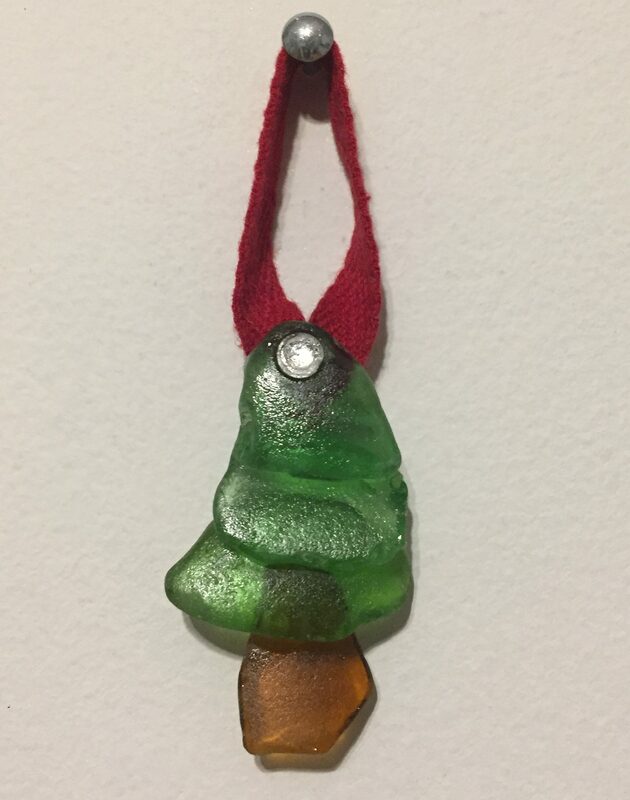 Today’s easy under 30 minute gift idea is a Seaglass Christmas Tree ornament. I have collected Seaglass for a good number of years and usually display it in dishes scattered around my house. A dear friend of mine makes wonderful art with some of the Seaglass she has collected and encouraged me to finally use some of mine, other than just in jars and dishes around the house. LOL as you will see I started out slow. I only used four pieces of seaglass, some e6000 glue and a ribbon for hanging. To make one similar to the one I made you need three pieces of green glass that are similar in shape and size and one piece of brown Seaglass. You simply overlap the green pieces and glue them in place and add a brown piece that looks like a trunk on the back of the green pieces at the widest end. I added a piece of red cotton ribbon on the back and a rhinestone for decoration on the front. I didn’t like the fact the e6000 glue looked shiny when it dried against the natural look of the Seaglass so I decided to give the whole thing, both front and back a clear coat of nail polish. Here is picture before I added the clear coat of nail polish. So if you have any Seaglass and are wondering what to do with it here is a link to my Wandaful Seaglass Pinterest page where I have pinned lots of ideas, and maybe one of these days, I’ll even decide to try another project. Have you ever made any Wandaful Things from Seaglass? If so I’d love to see what they are. 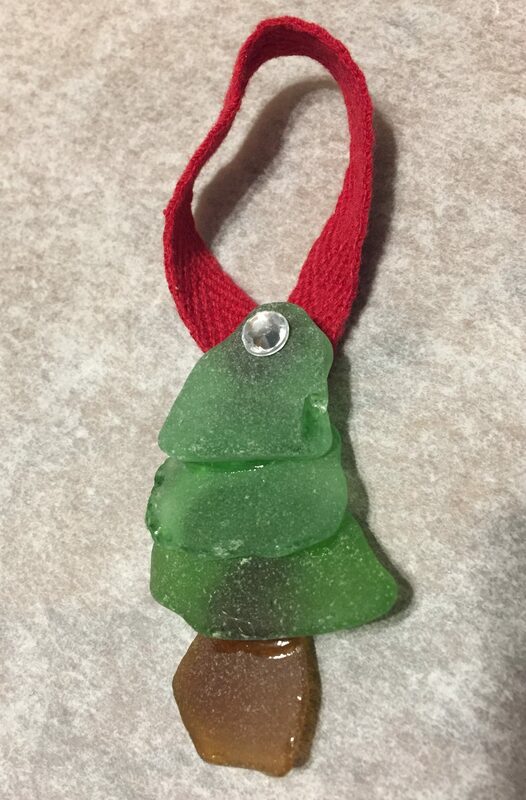 This entry was posted in 12 Days of Christmas, Decorate, DIY and tagged 12 Days of Christmas, cheap, Christmas, Crafts, Decorate, DIY, e6000, easy, glue, ideas, inexpensive, repurpose, reuse, seaglass. Bookmark the permalink. I love this….I have lots of sea glass, I really should make some. Great idea! Yes you should and send me pictures..really the possibilities are endless!